The Wackysox Christmas Tree Socks feature an ultra-high performance foot made from 75% coolmax and 25% polyamide. Coolmax is the original moisture management fabric featuring advanced wicking technology which helps keep moisture away from your skin - keeping you dry and cool, so you can play harder. As with any Wackysox, the talking point is always the design and this offering lives up to the name. 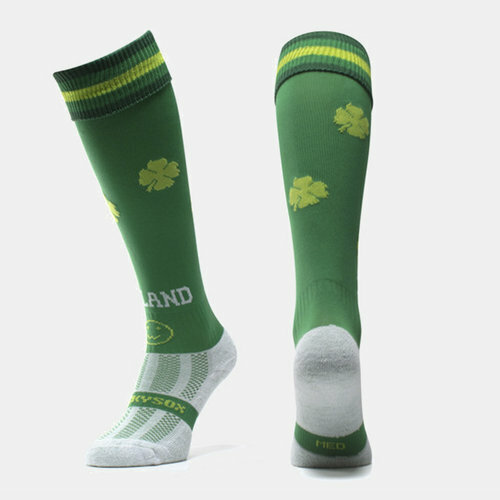 Embracing Ireland, an emerald green tone to the socks sees a number of lucky four leaf clovers spread across the leg and complemented by 'Ireland' stitched in white around the bottom of the shin. To complete the look, darker green and lime bands wrap around the turn-over to deliver a distinctly Irish look from toe to knee.